The Housatonic Camera Club meets the third Tuesday of the month from September through June at Noble Horizons in Salisbury, CT. The Club also offers annual programs that are open to the general public. These programs can range from exhibits and slide shows to field trips and workshops teaching the basics of photography to cutting edge technology and techniques. In the past, HCC exhibitions include the Douglas Library in Canaan, CT, the Salisbury Bank and Trust in Lakeville, CT, the Moviehouse Gallery in Millerton, NY, the Millbrook Library , NY, and Noble Horizons in Salisbury, CT.
As part of the New England Camera Club Council (NECCC) and Photographic Society of America (PSA), three times a year members are encouraged to submit photos for competition within the HCC. 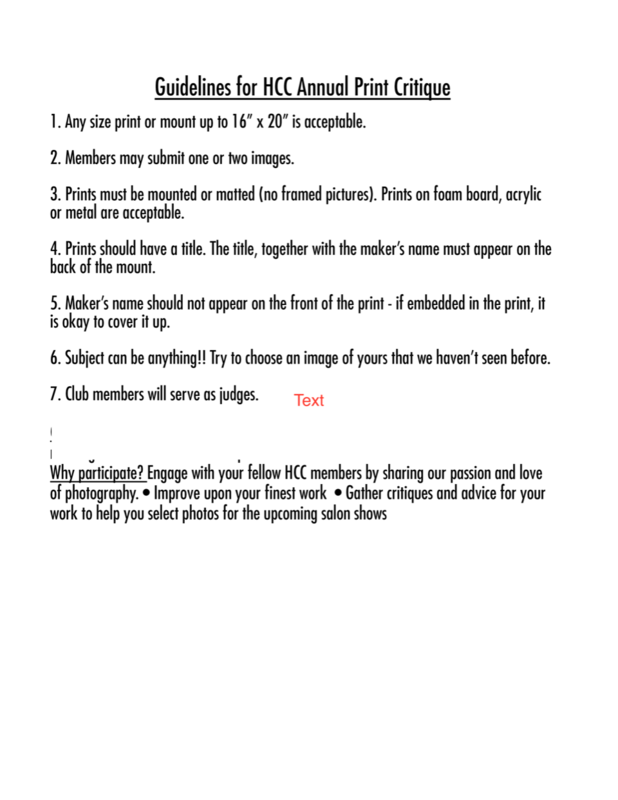 Those chosen to go on to the next level of competition are sent to the NECCC and PSA for consideration with photographs from member New England region (NECCC) and international (PSA) camera clubs. By Founding Member, Fran Kelsey (1914-1999) "The Housatonic Camera Club was started under false pretenses. In the mid 1950's, Ward Hutchinson, a Sharon resident, entered [into a slide contest] a slide of a yellow barn in the snow on Calkinstown Road, Sharon. He won first prize. The prize money was to be divided by $50 going to the photographer and $25 to go to the camera club. But there was no club! So Ward quickly organized one, appointing himself as president; Phil Reep, Treasurer; Fran Kelsey, Secretary. Nothing much else happened until 1957, when about 20 of us gathered at the Scoville Library to show our slides. 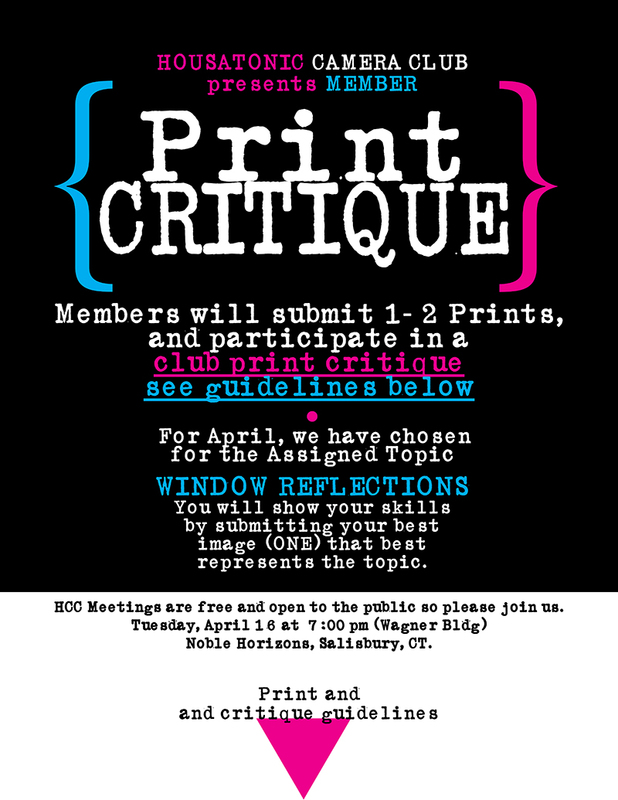 This was the First Annual Meeting of The Housatonic Color Camera Club." First Annual Meeting, April 30, 1957. Officers elected unanimously from nominations made from the floor. President:	Edward W. Hutchinson Vice President:	Edward Gates Secretary:	Mrs. H. Lincoln Foster Treasurer:	Philip Reep Voted that secretary also be publicity chairman. By-laws are to be drawn up by officers for approval of members. Membership fees: $3.00 a single membership. $5:00 a couple membership. A quorum is to be considered present when a small number of members are present at a meeting. A field trip to Kent Falls was discussed. Models will be available. June 22 set as date, with alternative date of June 29 in case of rain. Suggestions for slide subject at a future meeting: Dusk Silhouettes Next meeting to be held May 28 at 8 p.m. in Scoville Memorial Library. This to be the final formal meeting until next fall. Slides shown by members had a subject: Patterns. There seemed to be some confusion as to what was "pattern" and what was "design." About 20 members were present. The Secretary's notes for that [evening] "As our group attendance grew, we moved across the street to the Salisbury Town Hall. Since 1970 we have been invited to hold our meetings at the Hotchkiss School Science Auditorium Griswald Science Building] through the good influence of Russ Hansen, Hotchkiss science teacher" â€¦ "Bill Hain, president (1963-1966) was the first to realize the importance of a Camera Club Newsletter. In 1967 Fran Kelsey became the first editor, followed by John Rudd, Oliver Eldridge, Sid Shore and Ian McCunn." Fran Kelsey, 1995 (HCC Historian) A Brief Update Since 1995 At some point in time prior to 1990 the word "Color" was dropped from our Clubs name. Then on Tuesday, November 18, 1997, The Housatonic Camera Club (HCC) relocated to The Life Long Learning Center, Wagner Building, Noble Horizons, 17 Cobble Road, Salisbury, CT. Earlier in the year we had been notified by Hotchkiss that major building construction was in the works and that we would have to find another location in which to meet. We would be welcomed back when this work was completed. After so many happy years at Hotchkiss, this was a rather traumatic moment for us. A committee was formed to find a new home. This search narrowed down rather quickly to Noble and we have been happy campers ever since. Though at first some of us felt that we would miss the large space, equipment and screen at the Science Hall, we shortly discover what a more confined yet adequate space offers. The word comradie probably describes it best. We were, by the very nature of the room we now meet in, brought closer together. Kitchen facilities, seating, audio visual equipment â€¦ everything we could possibly desire was right at hand in one room; all provided by the Noble staff and always set up and tailored to each meetings needs. Founded the Housatonic Color Camera Club [now the Housatonic Camera Club] (HCC) in 1956 and also founded the Connecticut Chapter of the Photographic Society of America (PSA). Author of many articles published in the PSA Journal, Popular Photography and other photographic magazines. He was well known as a Camera Club judge, speaker, slide lecturer and teacher. He exhibited in the 1964/65 New York Worlds Fair at the Eastman Kodak Pavillion. February 2007 January 2007 .